There are a variety of computational methods to choose from to solve almost any electronic structure problem in nanotechnology and biotechnology, including problems involving complex systems with hundreds of thousands of atoms. This book presents the best and most useful of these computational methods, carefully explaining each one's strengths and weaknesses. Moreover, a broad range of practical applications are developed and then demonstrated with the use of detailed examples, helping you choose the best method for your particular needs. -Part A, DFT: The Basic Workhorse, explores the use of density-functional theory (DFT) for performing electronic structure computations on ground and excited states of large biological, chemical, and physical systems. -Part B, Higher Accuracy Methods, presents methods that can be used when modern DFT approaches don't work, including quantum Monte Carlo, coupled cluster calculations, and renormalized band-structure theory. 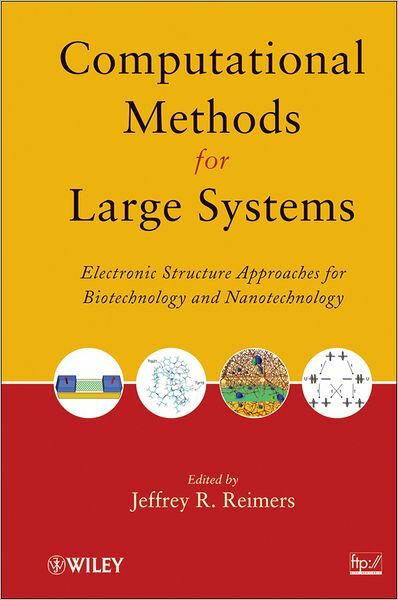 -Part C, More Economical Methods, examines methods such as semi-empirical DFT and Hartree-Fock-based approaches as well as empirical Hubbard models that enable researchers to work with larger systems at more approximate levels. -Part D, Advanced Applications, applies electronic structure methods to nanoparticle and graphene structure, photobiology, control of polymerization processes, non-linear optics, nanoparticle optics, heterogeneous catalysis, spintronics, and molecular electronics. With extensive references to the primary literature, Computational Methods for Large Systems is an ideal reference for computational scientists as well as a text for graduate students in computational chemistry, physics, biochemistry, biotechnology, materials science, and nanoscience.